Every person deserves to feel great about themselves, like what they see each day in the mirror and walk into any room with confidence. Our coloring is not a mistake. Nature doesn’t get it wrong. When we embrace our natural coloring – by repeating and complementing it in what we wear – we create visual harmony. in what you wear and how you look. whether it’s minimal or maximal. and save money by knowing what works for you. To Curate is to select, organize, and present content using professional knowledge. During a personal color analysis, we will identify and select your custom color palette, organize it in a way that you can use, and present it in a way you can understand. A personal color analysis is the first step to having a wardrobe and style that works for you. 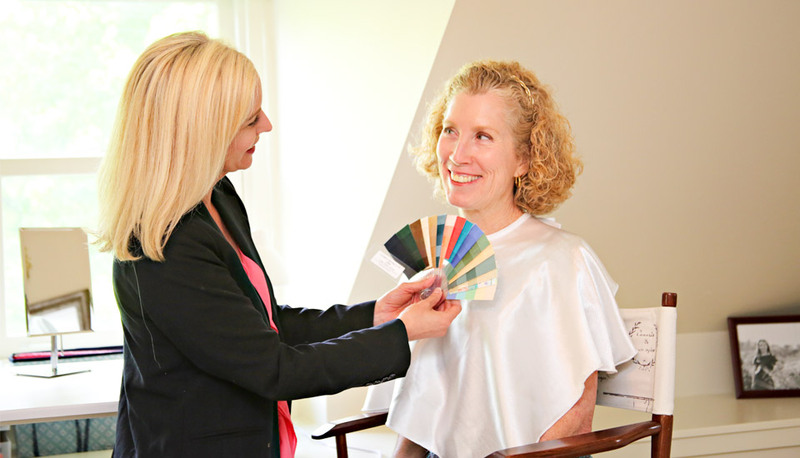 During the analysis, you will discover your unique personal colors – those reflected in your hair, skin, and eyes – which will allow you to see yourself in a whole new light. Nature always colors our skin, hair and eyes in perfect harmony. You will learn how to use those colors effectively to present the best version of you – one that is harmonious with who you are and what you want to present to the world. Once you discover your unique color profile, you can easily curate your closet and develop a functional wardrobe that allows you to shine. (Read about how a personal color analysis changed my life).